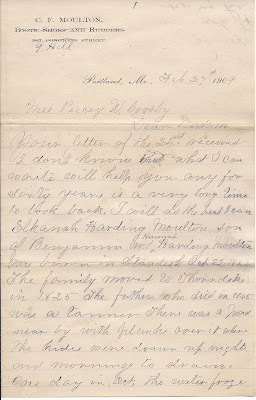 Letter written on February 27, 1909 at Portland, Maine, by Thorndike native Charles Foss Moulton, in response to a request for information on the Moulton family by Mrs. Percy Walter Crosby, [Clara Bell (Gordon) Crosby]. 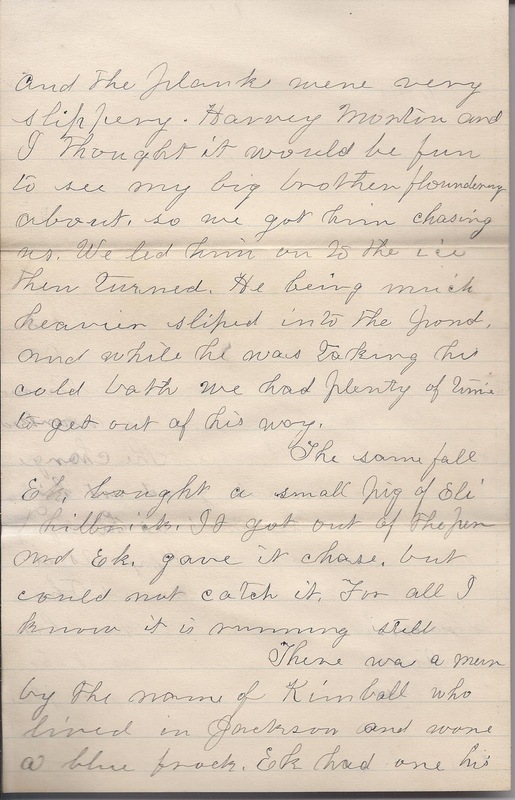 Scans of the pages of the letter and transcript below. Charles Foss Moulton was born June 12, 1833 at Thorndike, Maine, the son of Benjamin and Hannah (Harding) Moulton, who were born in Saco, Maine, and Gorham, Maine, respectively. Charles' paternal grandparents were Jonathan and Agnes (Foss) Moulton. His maternal grandparents were Elkanah and Hannah (Knight) Harding. On January 9, 1862 at Portland, Maine, Charles Foss Moulton married Elizabeth Reed Millett. She was born March 15, 1839 at Paris, Maine, the daughter of Amos and Dorothy Sprague (Reed) Millett of Oxford County, Maine. 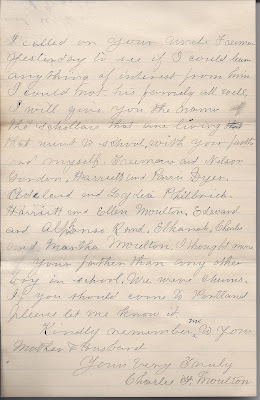 Charles and Elizabeth lived at Portland, Maine, where Charles operated a boot and shoe store, as indicated in the stationery he used. 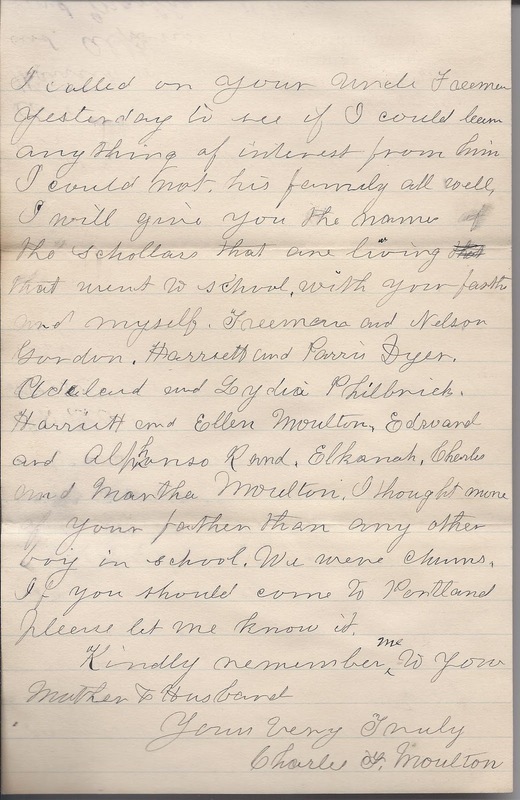 I found at least two children for the couple, both daughters, Dora Harding Moulton and Ellen Gertrude Moulton. 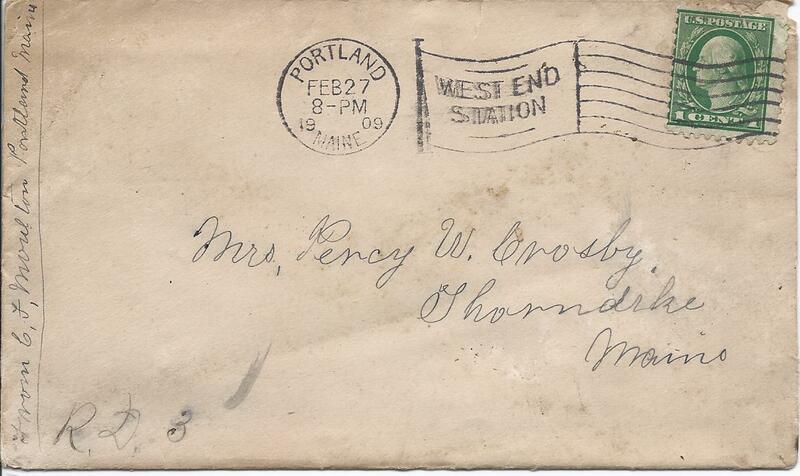 The letter writer, Mrs. Percy W. Crosby, was Clara Belle (Gordon) Crosby. She was born June 19, 1869 at Thorndike, the daughter of Daniel Gordon, Jr., and wife Alvina D. (Whitney) Gordon, nicknamed "Allie". 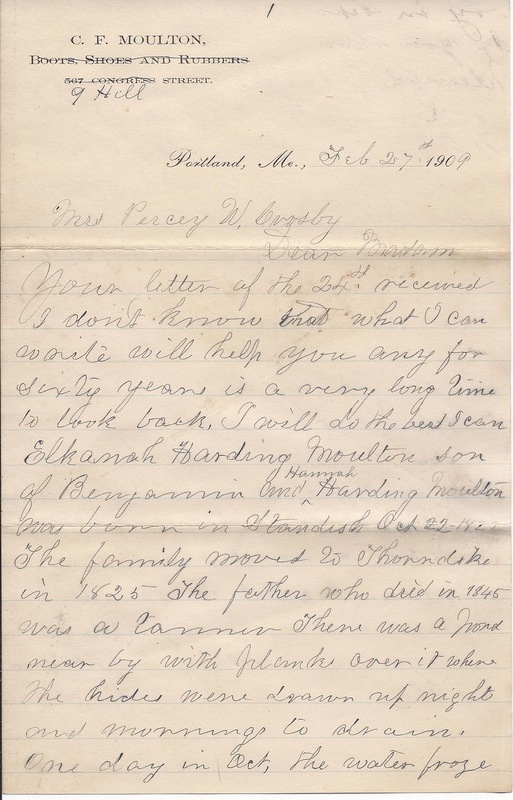 In the letter, Charles Foss Moulton mentioned being a school chum of Clara's father and of recently visiting her Uncle Freeman, who was a brother of her father Daniel Gordon, Jr. Like Charles, Freeman Gordon had moved to Portland, Maine. I searched for a common ancestor between the Crosby, Gordon and Moulton families but didn't find one at first glance. Apparently, Clara was looking for some stories of her father's youth, and the Moulton boys, Elkanah and Charles, figured into it. 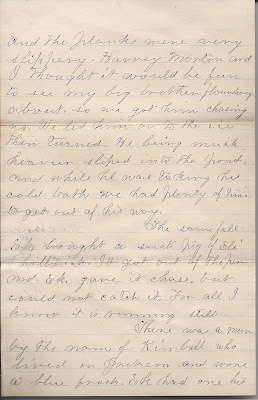 She must have appreciated Charles' kind words about her father, who had died a few years before the letter was written. Clara's Belle's husband, Percy Walter Crosby, was born October 2, 1864 at Unity, Maine, the son of William and Nancy Catherine (Pendleton) Crosby. See scans of the Family Records pages [and inserted items] of two Bibles of Clara Belle's parents here at the Maine and Maritime Canada Genealogy network. One Bible was presented to Daniel Gordon by Mrs. Arvilla Hall; the other was presented to Alvina D. Gordon by her brother Charles [Whitney]. 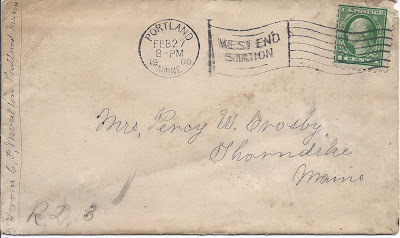 The inserts include clippings, leaves and early 1900s letters, one written by Alvina D. (Whitney) Gordon, with references to Belle and Percy and to the Spiritualist camp Temple Heights at Northport, Maine. If you have any corrections to the material above, or if you have insights into the Moulton and Gordon families of Thorndike, please leave a comment. 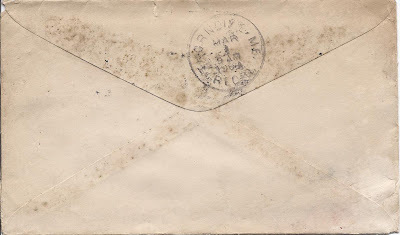 Your letter of the 24th received. I don't know that what I can write will help you any for sixty years is a very long time to look back. I will do the best I can. Elkanah Harding Moulton, son of Benjamin and Hannah Harding Moulton was born in Standish October 22. The family moved to Thorndike in 1825. The father who died in 1845 was a farmer. There was a pond near by with planks over it where the hides were drawn up nights and mornings to drain. One day in October, the water froze and the planks were very slippery. Harvey Moulton and I thought it would be fun to see my big brother floundering about, so we got him chasing us. We led him on to the ice, then turned. He being much heavier slipped into the pond and while he was taking his cold bath, we had plenty of time to get out of his way. The same fall Ek bought a small pig of Eli Philbrick. It got out of the pen and Ek gave it chase, but could not catch it. For all I know, it is running still. There was a man by the name of Kimball who lived in Jackson and wore a blue frock. 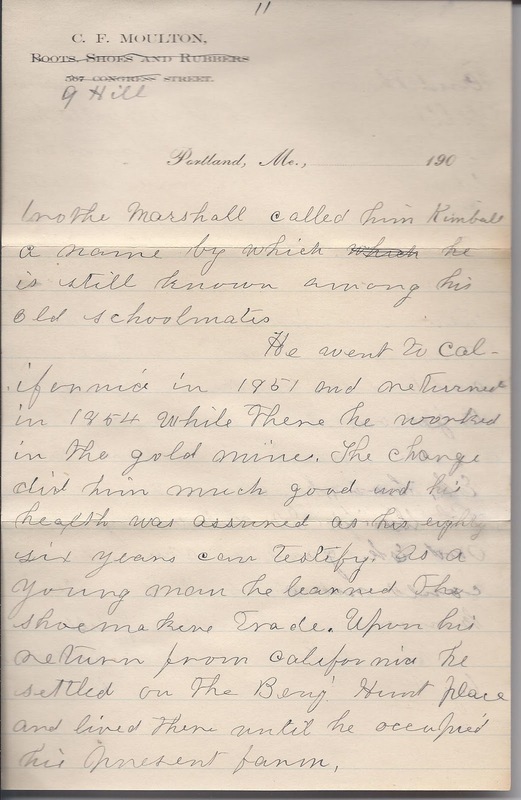 Ek had one; his brother Marshall called him Kimball, a name by which he is still known among his old schoolmates. 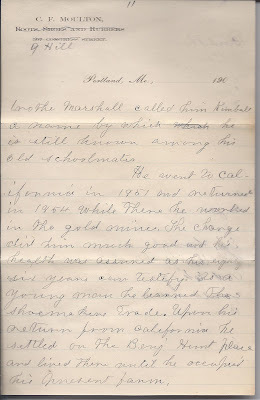 He went to California in 1851 and returned in 1854. While there he worked in the gold mines. The change did him much good, and his health was assured, as his eighty six years can testify. As a young man he learned the shoemaker's trade. Upon his return from California, he settled on the Benjamin Hunt place and lived there until he occupied his present farm. I called on your Uncle Freeman yesterday to see if I could learn anything of interest from him. I could not. His family all well. I will give you the names of the scholars that are living that went to school with your father and myself. Freeman and Nelson Gordon. Harriet and Paris Dyer. Adelaide and Lydia Philbrick. Harriet and Ellen Moulton. Edward and Alphonso Rand. Elkanah, Charles and Martha Moulton. I thought more of your father than any other boy in school. We were chums. If you should come to Portland, please let me know it. Kindly remember me to your mother and husband.